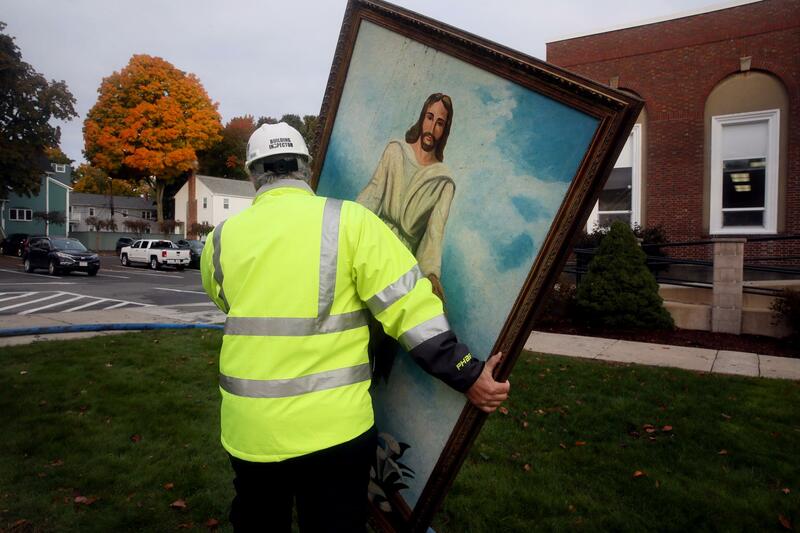 Building inspector Jack Roberto carried a painting of Jesus from the First Baptist Church after fire gutted the church Tuesday night. The painting somehow was not damaged by the fire. WAKEFIELD — For generations, the First Baptist Church stood at the heart of this town north of Boston, its white steeple rising high above a classic New England common on the shore of Lake Quannapowitt. On Wednesday, just hours after a massive fire ignited by a lightning strike engulfed the 1872 church, residents gathered in disbelief as workers dismantled the charred remains under drizzling skies. One item that survived: a painting of Jesus, virtually unmarked by fire, smoke, or water. From parishioners and parents whose children attended preschool in the building to residents who simply cherished its graceful presence, people here struggled to accept that the historic church had been damaged beyond repair. For many, it was a loss that made the town center seem bleak and unfamiliar. Burd, 41, is a teacher at Tall Spire Nursery School, which had its classrooms inside the church. Her own children, ages 7 and 10, had gone to school there. “To try and explain to them that they’ll never be able to go back in that space — that is still a very, very special and place for them, even though they’re so much older . . . You leave a part of your heart at Tall Spire,” she said, her voice catching in her throat. 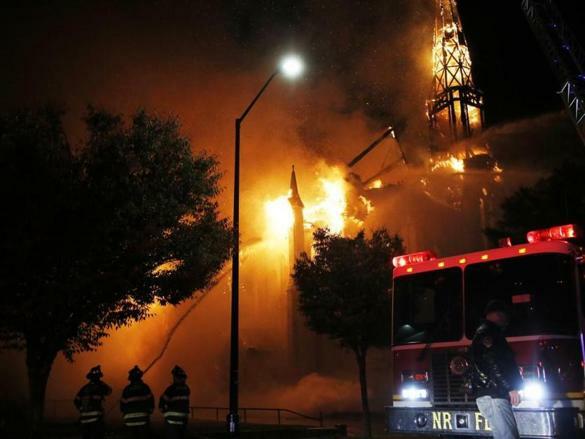 In a statement, church officials expressed gratitude that no parishioners were hurt and thanked firefighters for battling the seven-alarm blaze. A crew from Pathfinder Tree Service worked on removing the spire from the fire gutted First Baptist Church on Wednesday morning. Interim Pastor Norm Bendroth said Tuesday that local clergy from other places of worship had already offered space for the congregation of about 100. The church council had scheduled an emergency meeting for Wednesday night. The fire was reported around 7 Tuesday evening after powerful thunderstorms rolled through Greater Boston, downing power lines. The fire started after lightning apparently struck the roof, said Michael Sullivan, the town’s fire chief. Once the fire reached the empty space between the ceiling and roof “there was no stopping it,” he said. The fire caused an estimated $1 million in damage, he said. Sullivan said a meeting was ongoing at the church when the fire broke out, but that no one was inside the building when the fire gained strength. At the height of the fire, some 100 firefighters were at the scene. Some sustained minor injuries, Sullivan said. 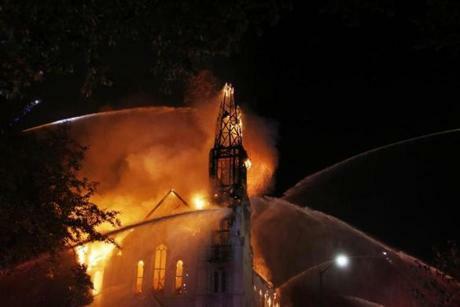 Firefighters managed to prevent the fire from reaching neighboring buildings, although some nearest the church sustained relatively minor damage, he said. On Tuesday, Josh Levesque, 35, had done some minor renovations at the church, installing a 17-foot replacement window midway up the steeple, he said. He removed a plywood panel and then hoisted, stabilized, painted, and sealed around the heavy, textured glass. 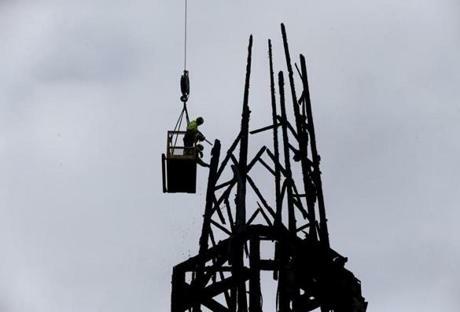 “I was hoping that we were going to be able to do more work to this place in the future, and it’s just not going to happen anymore,” said Levesque, a steeplejack for Salem-based American Steeple & Tower Co., which is owned by his father, Bob. Bob Levesque, 59, said he had completed multiple restoration projects at the church, going back 40 years. The Italianate structure was constructed around 1872 and rebuilt in 1912 after a fire, according to the National Register of Historic Places. Bob Levesque said that this time, rebuilding would be prohibitively expensive. On Wednesday, observers gathered near the church to watch, sometimes tearfully, as a demolition crew took apart the destroyed building. Amid the loss, parishioners took a measure of comfort that the painting of Jesus, seen standing in a white robe with crucified hands extended, had survived. The artwork had hung just inside the church’s front doors and was somehow left intact. Parishioner Kris Rankin wiped a tear from her eye while looking at the fire gutted First Baptist Church. The painting will be given to a former pastor of the church, said Susan Auld, a former parishioner who was married at the church in 1995 and later christened her four sons there. 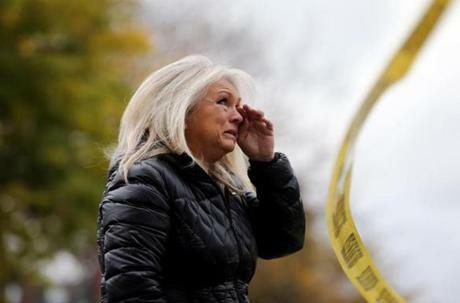 Auld, 54, said she had come to the church with a neighbor as the fire raged. She watched it for more than four hours. First Baptist had been part of her family’s life for generations. Her mother and grandmother were parishioners, and her sister had been married there. Auld had gone to Sunday school and sung in the choir. Firefighters battled fire at the First Baptist Church Tuesday night.